An outstanding record of academic excellence, communication and wider community engagement has made Dr Emily Flies a worthy winner of the 2018 Tasmanian Young Tall Poppy Award. Dr Flies, from the School of Plant Science, is currently exploring how human-driven changes to the environment are impacting human health. With her partner Dr Andy Flies, she founded the Science in the Pub program about four years ago, initially in Adelaide, and now a popular fixture in Hobart*. She was named the STEM Communicator of the Year for Tasmania in 2017. The ‘very competitive’ runner-up was Dr Lila Landowski, a neuroscientist from School of Medicine, is currently investigating stroke and nerve regeneration. She also regularly engages with the community through science segments on ABC radio, digital media and public talks. Dr Landowski was recently anointed as an Australian Science Superhero by Australia’s Chief Scientist. The Tall Poppy Campaign was created in 1998 by the Australian Institute of Policy and Science to recognise and celebrate Australian intellectual and scientific excellence and to encourage younger Australians to follow in the footsteps of our STEM stars. The General Manager of the Tall Poppy Campaign, Stephen Burke, attended the Tasmanian awards ceremony at the University Club on Wednesday (7 November 2018), co-presiding with the University’s Deputy Vice-Chancellor (Research), Professor Brigid Heywood. *The next Science in the Pub event is scheduled for Thursday, December 6, at the Republic Bar and Café in North Hobart, and is entitled: The nature of conservation and the conservation of nature: a philosophical, legal and scientific discussion. 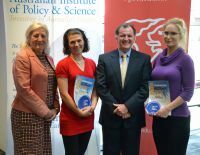 Pictured: from left, Professor Brigid Heywood, Dr Emily Flies, Stephen Burke and Dr Lila Landowski.